Late last year, I opened my emails to find a message from the lovely Louise Middleton of Golden Bear Belts, inviting me down to the secluded Kudhva site to stay for a brisk autumnal weekend. After googling exactly what a ‘Kudhva’ was and subsequently clicking the website link, it was an instant hell yeah! Set in a 45-acre disused quarry, Kudhva (the Cornish word for hideout) is spectacularly unique. 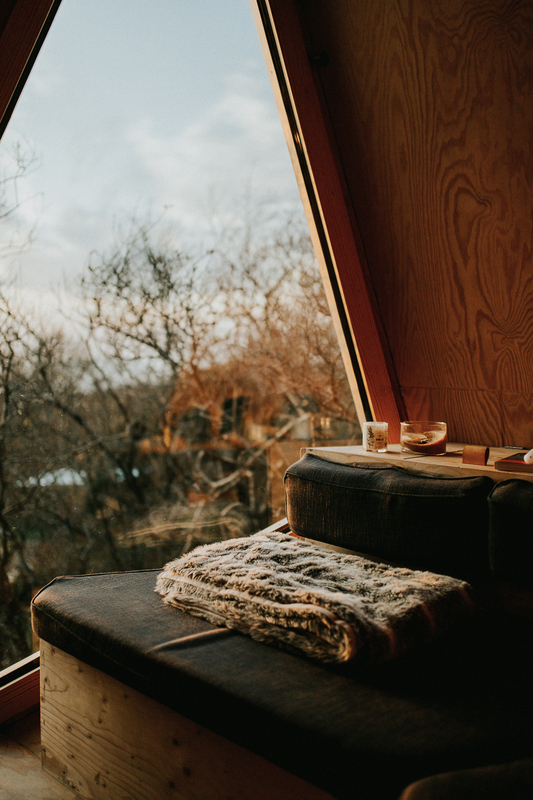 The cabins are what initially drew me in with their striking angular glass window panes and scandi-vibe wood cladding. The way they emerge from the surrounding countryside makes them seem like something out of a sci-fi film and I knew I’d be in for an extraordinary experience… I wasn’t mistaken. K1 : Our Kudhva cabin for the weekend. Of course, I brought my partner and travel pal of five years along with me and he was equally excited by the opportunity to visit our beloved Cornwall again. Well, that and the fact we’re both massive cabin junkies who endeavour to stay in them over hotel rooms any day of the week! So, we set off from Bristol in early November. Late as per usual and as there’s not a lot of daylight at that time of year, it was already ominously dark before we had even hit the road. The track in the daylight. When we arrived, we drove along the steep gravel track that snaked up the hillside through knotted gorse thickets and shadowy crooked trees. I’ll be the first to admit that it was a little creepy, though I was comforted by the fact I wasn’t alone. We were armed with a single torch between us, boots for the muddy terrain and a sketched map of roughly where our Kudhva cabin was in relation to the other outbuildings that were a little more obvious in the dark. Luckily, we found it no problem, unloaded our gear, lit some candles and settled into our surprisingly warm and cosy home for the night. The next day we were treated to a beautiful autumnal morning sunrise that bathed the whole hillside in gold. I took the opportunity to get my bearings and take some photographs of the site itself. There was a large communal building in the centre of the site that was equipped with cooking essentials, two power sockets, a swing chair and an absolutely massive wooden banquet table running the length of the room. I could only imagine the feasts that had been held with friends both past and future. Also, within the building were two toilet cubicles, two showers and information on the site and local area. 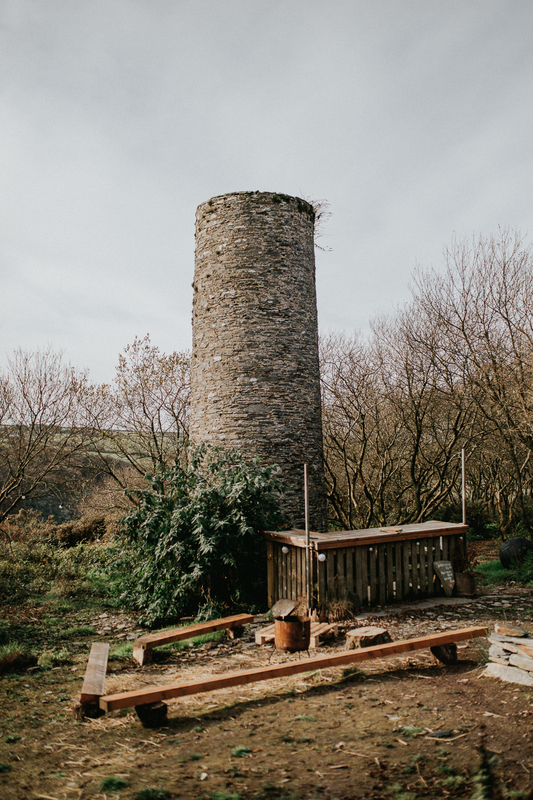 Other features of the site include a bar, Viking fire pit, slate cave, waterfall, reservoir (used for wild swimming), wood fired hot tub, not to mention the stunning views of Trebarwith Strand and remaining artefacts of a once operative quarry, such as the brick chimney and stately Engine House. We spent our first day mostly familiarising ourselves with the area and location-scouting as I had organised to do a brand shoot along the coast the following day. I actually shot one of my favourite ever images in our Kudhva cabin that evening as the light softened. I actually have it framed in my home studio as a little reminder to say yes to travel opportunities. We also built a campfire later that evening and huddled around it for warmth whilst a helicopter circled overhead. I’ll never forget the moment their colossal search light landed on us, illuminating two very startled and bewildered campers below. Something I’m sure we’ll laugh about for years to come. We headed back down to Trebarwith Strand in the morning (when the tide was out) to do the brand shoot and returned to camp where we finally met the fabulous Louise. She was organising a wedding photoshoot at the premises with photographer, Karl Mackie and the rest of the Kudhva crew. We were lucky enough to be invited as ‘guests’ to this fictitious ceremony and enjoyed an incredible spread of breads, wine and cheeses. The sense of community was what stood out for me most during the day. The fact that we hadn’t met anyone from Kudhva prior to the shoot and after just a few short hours, felt like family. Myself and the Kudhva crew. A guy called Finn, who was also the ‘groom’ in the earlier wedding scenario, showed us around the more rugged parts of the Kudhva site. 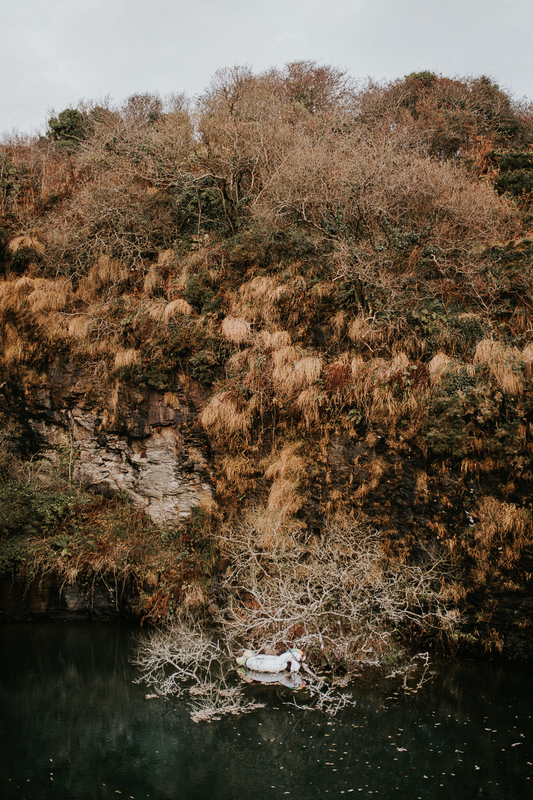 Sliding under barbed wire fences, climbing sketchy ladders and scaling loose slate cliff sides (whilst being told how easy it was to die from stepping on the wrong piece I might add) was worth it to discover the bountiful havens nestled in each of its far-reaching corners. Our last night just so happened to coincide with fireworks night (we really lucked out with the timing of our trip I know). We gathered around the old engine shed with Louise and friends, cooking hot dogs (veggie ones in our case) and drinking in the atmosphere for one last time as the stars twinkled in a rich black sky and the valley burst into colour below. I can’t think of a better way to have ended our time there. 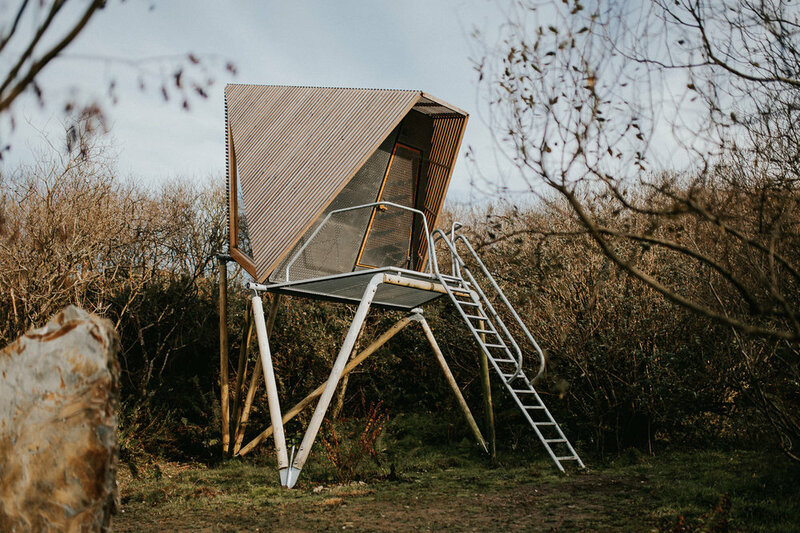 K3 : Our favourite cabin from a visual perspective. If you are looking to reacquaint yourself with nature, to bring out your wild side and stay somewhere beautifully remote then Kudhva is the perfect place for you. We’ll hopefully be returning in the Spring to stay in a tree tent and experience the place in a totally different light. I’m confident it will be just as inimitable. A massive thanks to Louise for being a total babe and giving us a glimpse into her world.